Disha, whose posters were used as visuals in a Republic TV news piece covering pro-ISIS slogans in DU has demanded an apology for the defamation. 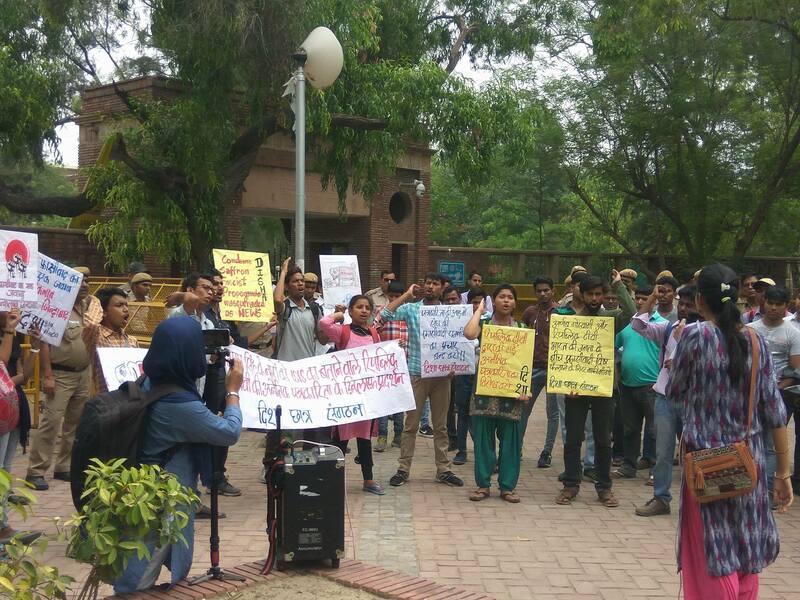 New Delhi: Disha Student Organisation on Wednesday, May 31, held a protest at Delhi University’s Arts Faculty against NDA politician and MP Rajeev Chandrasekhar’s new channel, Republic TV, and what it called its “saffron” journalism. The democratic student’s organisation had previously alleged that Republic TV had run a news piece on Sunday, May 28, that had portrayed its posters as pro-ISIS graffiti. Disha claimed that while covering the allegation that pro-ISIS and pro-Maoist graffiti had been scribbled at the Delhi School of Economics, the channel had aired images of walls covered with posters put up by Disha, which read “Make the dreams of Bhagat Singh come true”, “Education is everyones right, stop its commercialisation”. The channel’s news piece can be seen below. 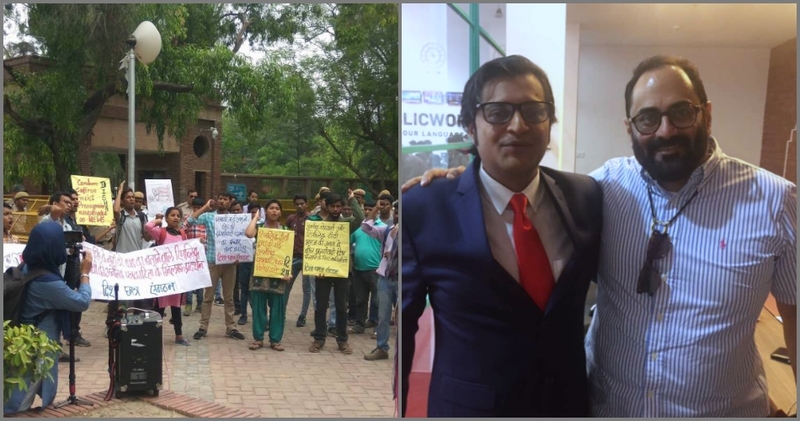 According to the press release from the protest, students from many colleges came together to condemn the “saffron propaganda disguised in the form of journalism by the likes of Arnab Goswami.” It states that such attacks on the democratic rights of Indians have become more frequent since the Modi government came to power and that such attacks tear away at the social fabric of the diversified nation. In a letter sent to Republic TV on May 29 and made available by Alt News, Simran states that these posters are “simply in keeping and carrying forward of the legacy and ideology of Bhagat Singh. The posters simply mention right to education for all” and that they would continue to fight for it. The letter seeks an apology from the news channel, and says that failing this, Disha will file a defamation suit against it. According to the press release, no apology has been aired yet. In an angry speech, Simran went on to state that most of Goswami’s stories lack credibility and are mostly propaganda in favour of BJP and the right-wing. Terming him the “posterboy” of the Sanghi agenda, she also reminded the crowd that he had aired the doctored tapes from the JNU incident in 2016 when he was an anchor at Times Now. She also referred to the IIT-M attack on a student as another example of the right-wing tendency to try to instil terror among those who try to raise their voice against anything. The Democratic Students Union (DSU) was also present at the protest. Another speaker at the protest, a member of DSU, Prabal, said that an attack of this kind on a democratic, pro-students organisation was not acceptable.